Apologies for the lack of posts. Have been travelling, sickly, had guests, work's been crazy, etc. This isn't multiple choice, incidentally—all of those things have been happening. Blech. 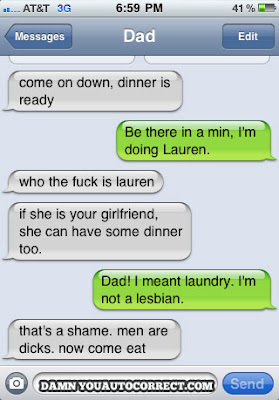 Anyway, to get back into the swing of things, how about another hilarious autocorrect conversation, this one featuring the world's most awesome dad?